Here is Shadow the Shiloh Shepherd puppy at 11 weeks old. She was playing happily with her toy ring, so I proceeded to make lunch and clean the dishes. I didn't check her for about 10 minutes because I was hungry and she had been playing contentedly. Then I heard a funny noise. Sure enough, she had gotten into the trash that was set on the floor for about 5 minutes on its way out the door. Lesson learned? Never set a trash bag down on the floor near a puppy. 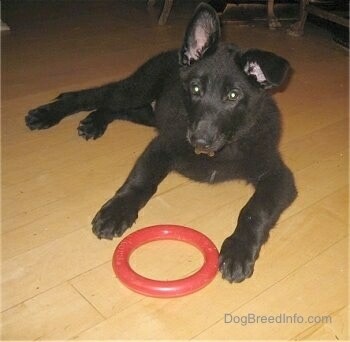 This is Shadow, a Shiloh Shepherd puppy at 10½ weeks old. Puppies will often find a secure enclosed or partially enclosed space to rest. It feels more like a den, or their birthing nest, if there is protection of some sort. Just be aware: if the space is something she can do damage to by sinking her teeth into, you keep your eye on her and teach her not to chew it. "Shadow, NO! Don't chew that chair!" 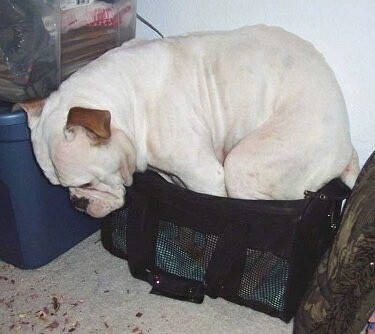 "But I wanna go too, Mom!’ Brandy Ann of Lioncrest Kennels, an Olde Victorian Bulldogge tries to squash her 75-pound body into our Chihuahua's carrier stored in a closet." "My Springer Spaniel mix, Nikki is a food hog. She will turn the bowl over, push it across the floor and generally do whatever she has to do to get the last morsel of food. This time her greediness got the best of her. I was in my bedroom and kept hearing a thumping noise in the dining room. It was Nikki bumping into the walls, table, and chairs to try to get her food jar off her!" "Imagine my surprise when I found Tanner, my one-year-old Goldendoodle happily working on his paper towel project. He'd managed to nudge open a cabinet, select two rolls of paper towels (note the different designs) and ’do his thing.’ He was very proud of himself." 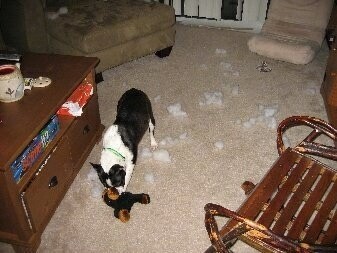 "I took this photo of Daphne, a Rat Terrier / Chihuahua mix at 6 months old. She was surprised when I caught her shredding a napkin." "Casey the 8-month-old Boston Terrier is a very curious dog. She likes to chew and explore everything in the house. Her favorite thing to do is to take things that do not belong to her and hide them under the bed so that she can chew on them at a later time. She sometimes gets too excited and runs like a nut through the house and jumps on the furniture. Once in a while she forgets to jump and runs into the couch head first." "TonyToo, a 1-year-old Bichon at the time (he is now 17 and going strong!). He had earned the right to free roam the house while we were out by being a good little puppy…until we came home to toilet paper strewn about! Needless to say, the bathroom doors were no longer left open."